Make a strong first impression with your printed marketing collaterals. Sometimes the newest form of advertising is the oldest. What does that mean? With so much attention focused on online advertising — such as inbound marketing, social media, analytics, click through metrics — the ‘old school’ methods often do not get the attention they deserve. While online marketing has transformed marketing for most businesses, traditional marketing tools still contribute significantly in marketing a business. A form of printed literature is often the first point of contact target customers have with a business. Since you never get a second chance to make a first impression, having well-designed marketing collaterals is as important as effectively marketing your business. An investment in well-designed information cards, business cards, brochures, pamphlets, hand-outs, gift cards, direct mail postcards, etc., can be an investment in a strong first impression with your target customers. As the name suggests, an information card provides information about your business, products or services. It is a single-sheeter that a potential customer could take away and refer back to. Your business logo and business cards leave the most lasting impression on your business. Investing in a professionally designed business logo and business card is often the most important design investment a business can make. A business leaflet provides an overview of your business, products, and services. Its design can reflect your business personality, values, history and more. It is important that any printed literature about your business reflects its style and personality. Whether you offer products or services, “product literature” provides an elevator pitch about what you offer. 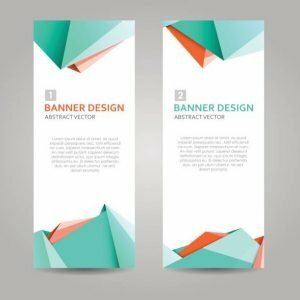 You should invest in printing literature about each product or service you offer, blending business identity, a unique design, and relevant information. If your business establishment gets visitors – retail outlet, professional’s office, restaurant, hotel, etc., — you want printed information cards the visitors could take away and refer to. This improves your brand reach, recall and repeat business. While email is convenient, traditional mass mailers like postcards and discount coupons are extremely effective. Ensure a good postcard design before you invest in postcard printing and distribution because the design can impact its effectiveness. Discount coupons can only be effective if they reach your customers. Advertising in newspapers can be expensive, and online coupons do not always reach everyone. Invest in well-designed promotional cards that you can mail to your customers. Our business has its roots in graphic design, brand identity, and logo design. 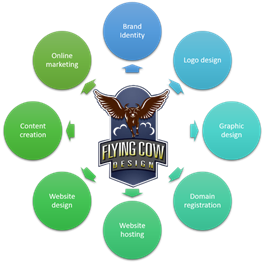 Established over two decades ago, Flying Cow Design has evolved into a full-service web design and online marketing agency. Through our evolution, we have continued to invest in maintaining high graphic design standards in all our services – from logo to website design. Our team of graphic designers have versatile design experience and can ensure a cohesive continuity between all your marketing material – printed and online. We take pride in our customer service standards ensuring you get the personal attention you deserve. Give your business the design edge by working with us for all your design needs. Talk to us about your business design and marketing needs today! Need help with Branding Services?